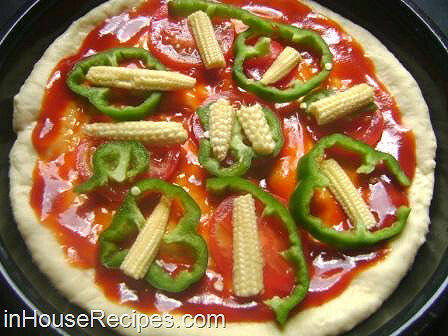 We all love Pizza and being a vegetarian, Veg pizza in an obvious choice. I love to have as many vegetables as possible on top. 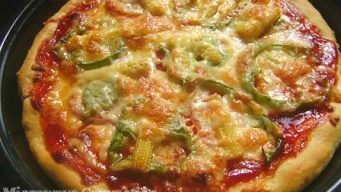 My personal favorite is green bell-pepper (called Capsicum in India) as it provides a lot of color and crunchiness to veggie pizza. 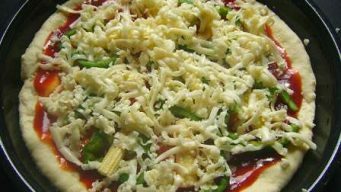 Normally, we buy the un-baked pizza base from market and then top it up with cheese and veggie's to bake. I have personally never liked the pizza base partially because of not been able to successfully bake it in a desired manner. The reason could be anything from the quality of the base or something else. So, I decided to make the fresh base at home and try the taste. The final product was certainly much better, hygienic and crispier. 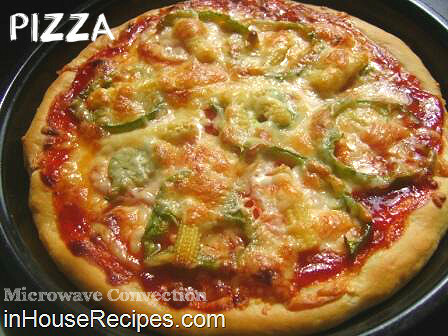 We make Pizza in Microwave convection Oven from scratch i.e. 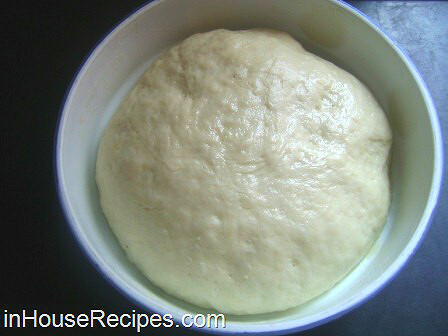 starting with Pizza dough. Here is the step by step recipe. Please remember that you do need a convection mode in your Microwave for baking. 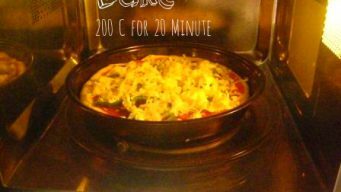 A simple microwave is not sufficient to run through this recipe. As far as brand is concerned, it does not matter. We use the Onida Microwave Convection Oven and we have seen our friends and relatives using IFB, Samsung and LG too. The process and recipe remains the same. You may have to refer your Microwave Oven's manual for turning the convection mode ON. Note: The Microwave Oven AND Microwave Convection are same. You cannot bake in a Microwave without convection mode. 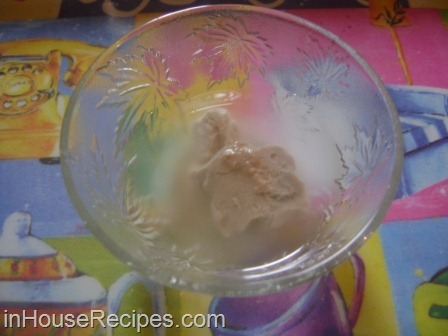 Read more about baking in Microwave Oven. We have collected all ingredients for making Pizza Dough. 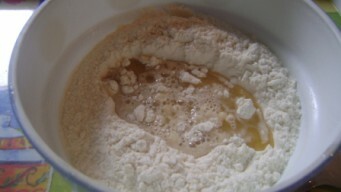 Soak the Yeast in 30 ml of warm water. 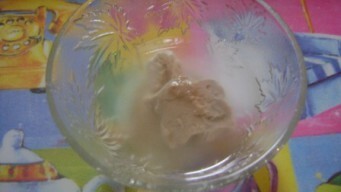 Mix it well to help it completely dissolve with water. 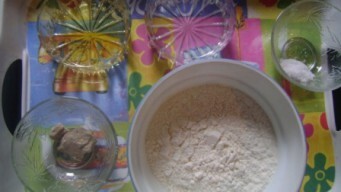 Now sieve the All-Purpose-Flour (Maida) in a big bowl. 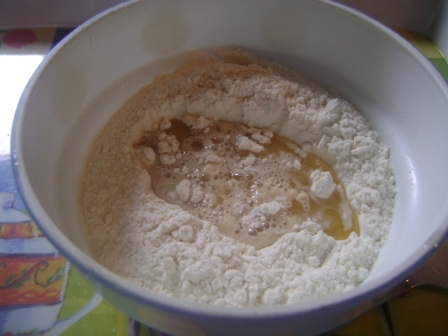 Add Salt, Oil and Yeast mixture in the flour. 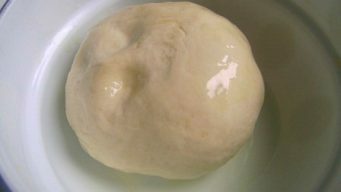 For making a smooth dough, we need to add water gradually and keep kneading it continuously. 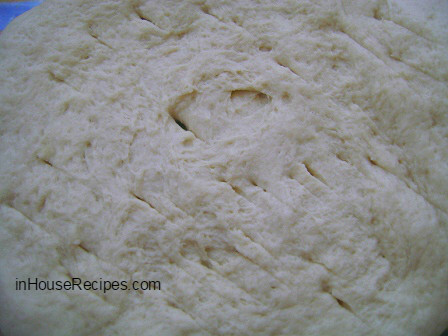 It will take about 4-5 minutes of kneading to get a good smooth dough. 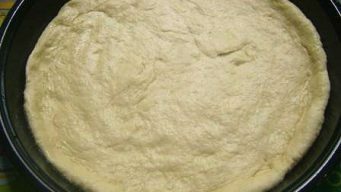 Dough is now ready, lets move on to fermentation. 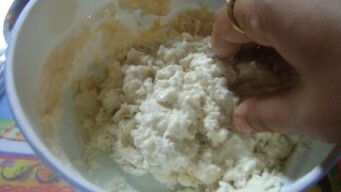 Take another bowl and add grease it with 1/2 Tbsp of Oil. Now add dough. 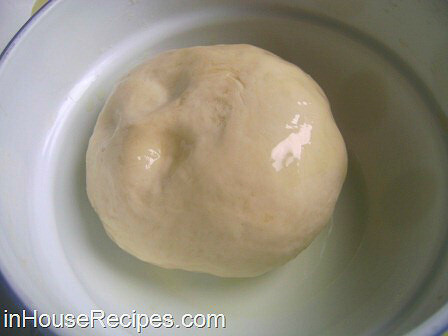 Roll it over once to make sure that the dough ball is covered with the greased Oil completely. 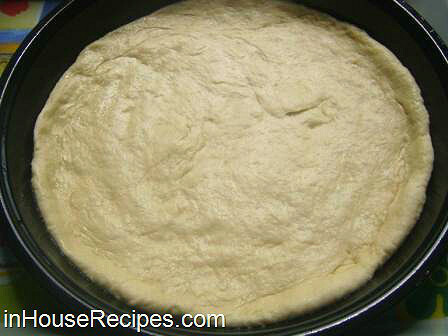 Cover the lid of the bowl and keep it aside for 1 hour for fermentation under room temperature. 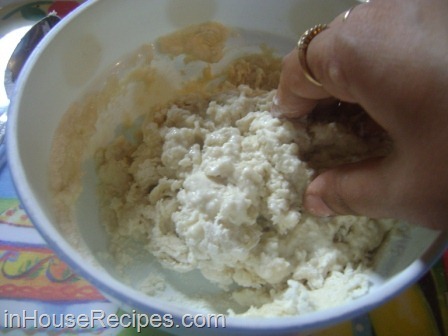 You may have to keep it aside a bit longer if you are making in in winter season. The normal room temperature that we are talking about here is around 30° C (86° F). The rule of thumb is to increase the fermentation time proportionally if the temperature is below 30° C and reduce, if it is greater than 30°. The more hotter the place, the better it is for faster fermentation. This does not mean that you keep it on burning stove to achieve the F1 speed. 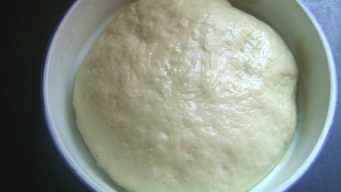 After 1 hour, open the lid and you will see that the dough has doubled in volume. This means that fermentation (Called Khameer Uthna in Hindi) has happened. 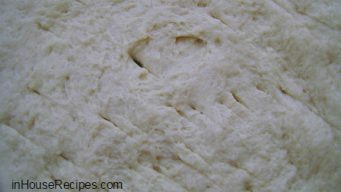 We are targeting to make a medium size (about 9 Inch diameter) Pizza with 1/2 inch thickness. 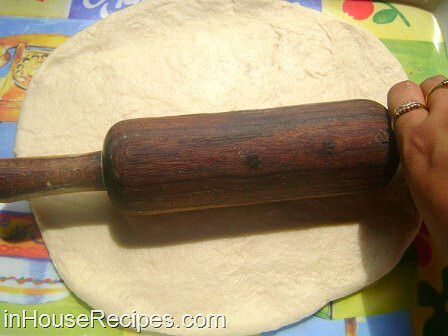 So, roll it in round shape with the help of a rolling pin. Add 1/2 Tbsp of Oil in a baking dish and grease it completely. I assume that you already have round shaped baking dish. We are using a Microwave with a convection mode. As a matter of fact, the Microwave with convection mode are good for baking as well. Before we start decorating, lets do some multi-tasking and put on the microwave on pre-heat to save time. Pre-heating is an important part of baking. It is done normally to bring the Microwave Oven to a pre-defined temperature even before we put anything to bake. 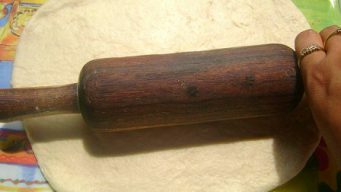 This helps in getting the best results and bake the bread (any bread for the sake of understanding) at the right temperature throughout the baking time. We want to pre-heat it on 200° C (392° F). Most of the Microwave/Oven come with a pre-defined options for doing this activity. Ours is no different. We are only required to specify the temperature and then just press the pre-heat button. That's it and it beeps once it reaches the specified temperature. It takes about 5 minute to reach this temperature. You should now have the Pizza topping ingredients ready with you. This is not a difficult job at all. Anybody can do it with ease. The best part is that you just have to throw whatever you want on top of it and Pizza will never complain! Please note that there are two (2) ways of decorating the Pizza. 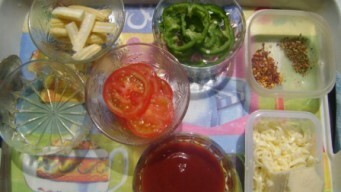 One is to place vegetables first and then top it up with Cheese. 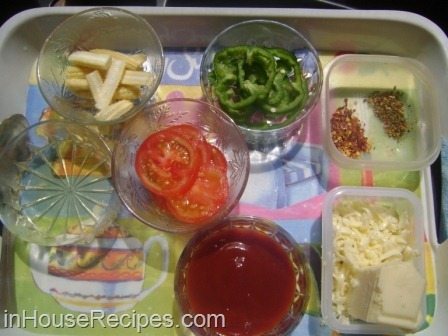 Second is to place Cheese and then top it up with vegetables. Which one you choose is your choice. I personally like to go with the first option as it helps reduce the chances of veggies getting a burnt face (normally due to high temperature in the Oven). We will now work on the best part of the Pizza making (one of my favorite) i.e. Pizza Decoration. 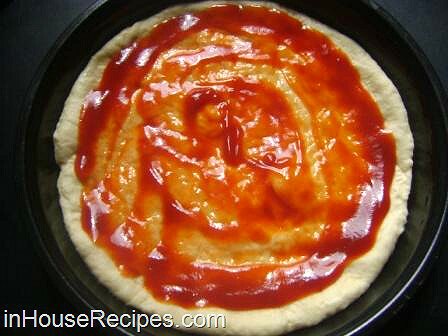 Spread the Tomato sauce all over the pizza base except corners (as shown in the image) with the help of a spoon. 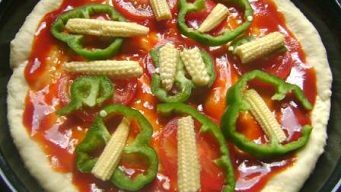 Now, place the Tomato rings, Capsicum and Baby corn. Sprinkle a pinch of Salt (approx. 1/4 Tsp or to taste) all over the Pizza. Grate the cheese all over the pizza. We are using Mozzarella; You can use any like Cheddar or Parmesan or a mix of all. I have tried the one at Domino's which is a mix of ALL (Mozzarella, Parmesan and Cheddar) and it tastes really good. It is up to you how much you want to eat just drop in the quantity as per your liking. Pour 1/2 Tbsp of Oil all over the pizza topping. This is not recommended for the faint heart and the diet conscious super models. You can skip this step if you want. By this time, your Microwave/Oven should have reached the pre-heat 200° C stage. Wear the Microwave/Oven safe gloves and dig in the pizza in a pre-heated microwave. Again, We are using our Microwave in convection mode (actually works like an oven). You would need to check your Microwave-convection manual to know more about how to activate the convection mode. 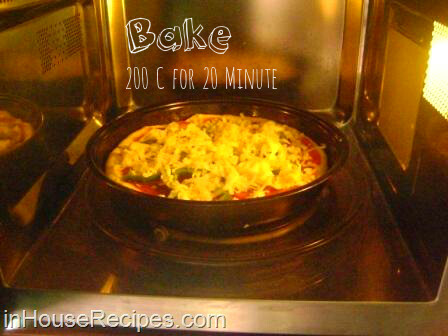 Close the door of your Oven/Microwave and put it on 200° C (392° F) baking for 20 minutes. After 20 minutes, Switch Off the Microwave/Oven and take out the Pizza. Remember to keep your Microwave safe gloves on. The hot Pizza is ready to serve. Look at the delicious Mozzarella cheese flowing all through the Pizza. We are just not able to control myself to grab a piece of this. What are you waiting for? Just wear your baking hat and give yourself a treat. I hope that you will make it at home with fresh ingredients available at home. Keep watching and cooking. 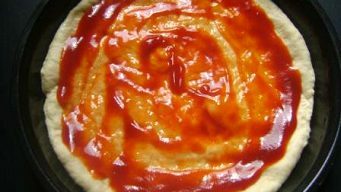 Pizza is served hot normally with Tomato Ketchup and Red Chili flakes (Dry Red chili crushed into small tiny pieces). 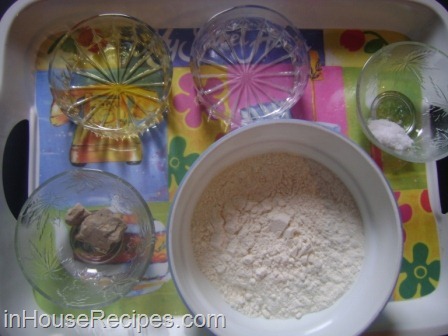 You can also use Oregano seasoning to sprinkle on your piece of Pizza pie. 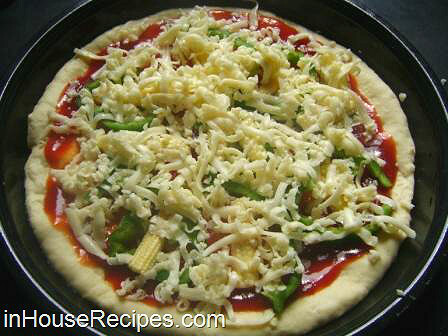 You can refrigerate the Pizza for up-to 3-4 days and re-heat in an OVEN (or Microwave Oven) before serving again. You can also use standard Microwave for re-heating. Re-heating in standard microwave tends to soften the pizza base. 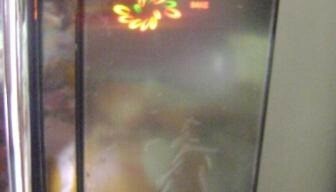 So, we recommend that you should use a Microwave Oven, if you have it for re-heating. 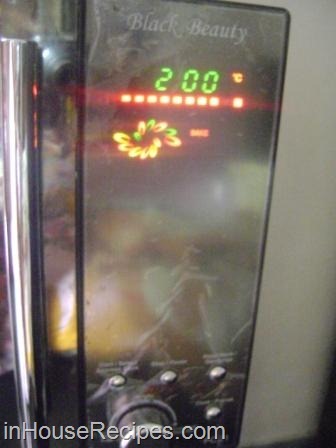 If you have no option other than standard microwave (no convection mode), then re-heat only for 1-2 minutes. Would you like to accompany the Veggie pizza with molten lava cake just like the way you do it in Domino's?You can also try making a quick desi Indian style hack of a Pizza with no Oven required for baking!